This is the default template for Docma; with a side-bar symbols menu, search and navigation features; and a beautiful layout. Make sure you have the latest Docma installed. Set template.path to "default" or "zebra" or omit it in your build configuration (docma.json). Configure and set template.options as described below. 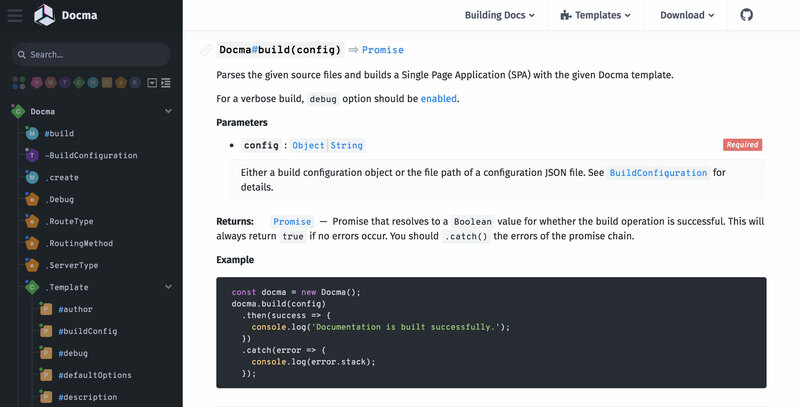 Template specific options that can be used when building your documentation with Zebra. title String|Object Title to be set both on the navbar and sidebar. If you want to set a link for these titles, pass an object. Default: ""
Note: Don't confuse this with document title (tag) which is set via app.title in the build configuration. ↳ title.label String Title to be set both on navbar and sidebar. Default: ""
↳ title.href String Link to be set for both navbar and sidebar titles. Default: "#"
↳ sidebar.outline String Indicates the outline style for the sidebar symbols. If set to "flat" symbols are listed with their long names. If set to "tree", symbols are listed with their short names; as an indented tree, depending on their hierarchical position. Default: "tree"
↳ sidebar.itemsOverflow String Specifies how to fit overflowing sidebar items. Either set to "crop" (crops the item and reveals on hover), or "shrink" (decreases font-size until it fits). Default: "crop"
↳ symbols.params String Specifies the layout style for documented parameters of a symbol. Possible values are "list" or "table". Default: "list"
↳ symbols.props String Specifies the layout style for documented properties of a symbol. Possible values are "list" or "table". Default: "list"
↳ symbols.enums String Specifies the layout style for documented properties of an enumeration symbol. Possible values are "list" or "table". Default: "list"
contentView Object Contains settings for content view, which is generated from markdown or HTML files. ↳ contentView.faLibs String|Array FontAwesome icon libraries to be included with the generated output. Set to "all" to include all libraries. To include an individual library; set to "solid", "regular" or "brands". Or you can set to a combination of libraries. e.g. "solid,brands". Set to null to exclude FontAwesome from the output. Default: "all"
↳ contentView.faVersion String FontAwesome icon library version to be used. Default: "5.5.0"
↳ navbar.dark Boolean Whether to enable dark theme on navbar. Default: false Note: If this is enabled, you don't need to set path for a dark logo. Linked labels that build the navigation menu on the top bar of the document. Each item is an arbitrary Object with the following properties. label String Label of the navigation item. Try keeping this short. Default: ""
href String Sets the link of the navigation item. Either a bookmark, a relative or external link. Default: "#"
Template options are defined within the build configuration. i.e. in a docma.json file. // Docma Template to be used. // Either a path, module name or "default"
Then you can build your documentation with these customized template options. Note: If you're upgrading from Zebra v1.x to v2.x, there are some breaking changes. Emoji shortcuts used in source markdown files are parsed into twemoji. Graphics and icons licensed under CC-BY 4.0. See FontAwesome license.